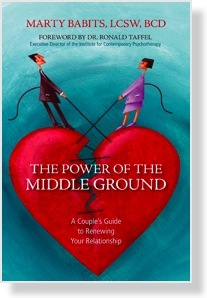 In the upcoming weeks, I look forward to reading The Power of Middle Ground: A Couple?s Guide to Renewing Your Relationship by Marty Babits and posting?my review and giveaway soon thereafter. But?while I await my review opportunity, I had the chance to read the following article: 8 Tips for Renewing Your Relationship This Valentine’s Day also written by Marty Babits.? I found?the tips mentioned quite interesting with a few jumping right out at me.? Maybe some of these will help you and your relationship get back to its Middle Ground. 1) How many ways do I love thee? Let me count the ways. Pick at least three qualities about your partner that you love. Gift each one of these with something special. For example, give her a CD by her favorite recording artist in celebration of whatever you consider to be her (or his) most appealing facial feature. Choose a clothing accessory that includes the color that you think best flatters your partner and celebrate the way they look in that color. Come up with a quality that you have always valued, from the start of your relationship onward and feature that in a message written in a blank card by you with a tender sign-off. De-emphasize the gifts and emphasize the qualities that you want to call attention to and celebrate. 2) Surprise! Believe it or not some psychoanalysts evaluate the psychic well-being of their clients by determining the degree to which they are capable of surprise! A person who is not responsive to surprise elements in their life is unable to respond spontaneously. Their capacity for joy — and feeling in general — is impaired. Give your partner a reason to light up the surprise center in their mid-brain! Think of something that they would like but will not suspect. Have you written them a poem lately? Have you recorded the opening strains of “You are the Sunshine of My Life” on a hand-held tape recorder lately and handed it to them with a post-it instruction to hit the play button? When was the last time you brought your sweetheart a passion fruit chocolate truffle from one of the finest chocolatiers in your community? Whatever it is, make it pleasant and surprising. By the way, the residual benefit of surprising your partner is that you activate your own surprise center. No pun intended, it will be surprisingly beneficial for you. 3) Hand your partner a prerogative pass. (Print it out on an index card if you like.) With this pass he or she will be able to exercise their prerogative in a situation where there is usually a conflict over who gets their way. The one limit to the pass is that they are not allowed to exercise a prerogative if it forces you to do something that you feel uncomfortable doing. Next time you have a conflict over which restaurant to go to your partner can flash the prerogative pass and you’ll go Italian if that’s their choice rather than whatever else you might have felt in the mood for. Again, this presupposes that you like Italian — whether or not it would have been your pick that evening or not. 4) Look your partner in the eye and tell them three things that you love about them. They can be big ticket items, like the way you feel together when you are making love. They can be smaller fare, like the way you love it when they wrinkle their nose and close their eyes when they are hysterical with laughter. They can be somewhere in between like when they listen to you explain something in a way that you yourself realize is quite impossible to follow without complaining that they got lost four times in the telling. Write down what you are going to say before beginning this one. Then read it with feeling as if you were auditioning for a part in a movie starring opposite whoever your greatest heart-throb might be. By the way, you can fantasize about a star from any era in this exercise. Living or dead, domestic or foreign — anything goes. Only make sure you deliver your lines with feeling. 5) Think about something that you and your partner have had trouble coming to terms with in the past year — like speaking civilly to each other when either of you is angry; or perhaps, discussing a conflict in your financial situation. Without referencing your partner, give a commitment to improve your own ability to speak about the topic without blaming. Tell your partner that you are going to accentuate understanding the issue from their point of view and that you are hoping to have fewer hurtful arguments this coming year. Tell them that you want to conduct your relationship in the middle ground as much as you possibly can; this means that you want to work together, acknowledge and appreciate each other’s hopes and dreams and make all plans with these understandings in mind. 6) Is your partner an exercise enthusiast? If so, did you happen to catch Marisa Tomei doing hula hoop exercises on The Ellen DeGeneres Show? The exercise looks like fun — read about comments on this product on Amazon — and if you think your partner would enjoy a novel kind of exercise, purchase the item and attach a note pledging, “I hope you enjoy going through this hoop. I look forward to going through all sorts of hoops with you! And I’m lovin’ it.” Note: Only take this suggestion if you and your partner have a similar sense of humor and you think this would tickle them. 7) Do you prepare a food dish that your partner loves? If the answer is yes, put an announcement inside your Valentine’s Day card saying that on such-and-such a date you will be cooking a blankety-blank dinner for them to continue on with the celebration of the love you share. Ask them to contribute on that night by bringing along whatever will enhance the meal for you — a favorite beverage or dessert that they can purchase or make. 8) Take a minute to think about a trait of yours that your partner has communicated having a problem with — for example, a hot temper or messiness. Think about any constructive suggestions that your partner has made that you think, when you are considering this calmly and not when you are in the heat of a disagreement, is reasonable and possibly something that you might be able to put into practice. This tip works best if you feel that the trait is something that you actually would like to change within yourself. Research self-help either on the internet or in the self-help section of your favorite book store and find out what authors suggest may be helpful in your particular situation. Jot down the best helpful tip you can find and write your partner a note stating that you have heard their complaint, take it seriously and are poised to work on it. Outline the plan that you have read about that makes sense and feel you can realistically implement. Describe it to your partner. Sit back and let the communication magic do its work. You will have just demonstrated acknowledgment of their feelings; appreciation of their communications on a difficult topic; acceptance of their concerns. You well may have instilled hope and mutuality into your dialogue. More originality in your renewal message signals desire to take things higher. Chocolate and flowers have their appeal, but can become real humdrum. So take some time, do some prep work and put these tips into action — as many as you can. Maximize connection with a fresh plan. Pick up a book that speaks to you on improving your relationship! And get busy because timing is everything and it’s almost Valentine’s Day! Marty Babits, LCSW, BCD (New York, NY), author of The Power of the Middle Ground: A Couple’s Guide to Renewing Your Relationship, is a psychotherapist in private practice and a member of the Executive Supervisory Committee of FACTS (the Family and Couples Treatment Service) of the Institute for Contemporary Psychotherapy. For more information, please visit www.PowerOfTheMiddleGround.com. .-= BG´s last blog ..Free Daily Dose of Financial Tips! =-. I liked tip #4 alot about looking your partner in the eye and telling them what you love about them, so Charming and Beautiful!